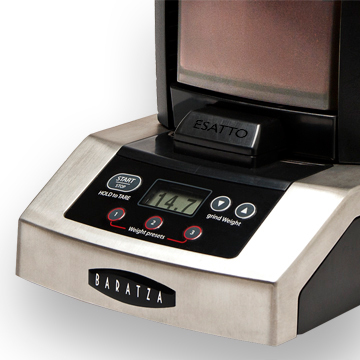 Sorry, we are currently sold out of 'Baratza Esatto Weighing Base'. Please check back later. Roastmasters offers FREE SHIPPING in the Continental US on the Baratza Esatto, and, the lowest allowable price that it may be sold. This creative addition to any of these grinders allows you to grind exact portions of coffee using real-time, weight-based control. Easy to assemble and even simpler to use, the Esatto provides you with three programmable dosage buttons, as well as a digital LCD window to read weight values. 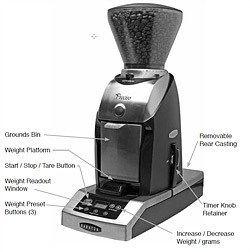 Rather than manually weighing your coffee, the Esatto weighs the ground coffee and automatically stops grinding. Acting a base with a weight load cell, this new addition to your Baratza Maestro Plus, Virtuoso, or Preciso is an economical and efficient way to weigh and grind coffee. Any one of these models sits atop the Esatto, which in turn, provides the scale functionality. With a footprint of 12.25� long by 5.25� wide, the Esatto adds only about 1� of height to your existing grinder. Three programmable dosages. Each of three buttons can store a programmable weight value. The programmed weights will remain stored in memory even if the Esatto is unplugged. Please see the Esatto Owner's Manual for more information.